"	I recently got Friends Blu-ray discs of the complete series to perfect my collection. I would like to get a copy of Friends Blu-ray disc and also put some of the content onto my iPad tablet so I could watch them during my tour. Does anyone know how to do these?" One would have to be from another planet to not know about the story behind the series of "Friends". 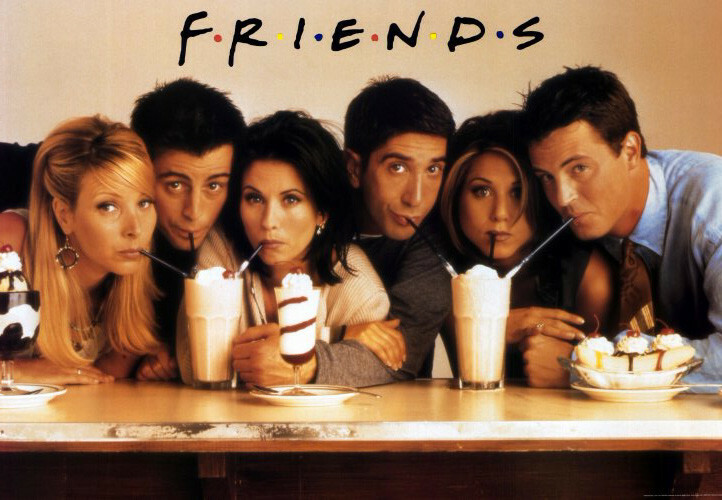 From 1994 to 2004, it is the best 10 years of Rachel, Ross, Monica, Chandler, Phoebe and Joey, when they are able to enjoy the best health, the most freedom, and the most disposable income. It is the memorial for yawn and youth, frown and friendship, as well as laugh and love. It is the first time for audiences to realize 10 years can also be such a short time. When they get married and moved out from the familiar purple apartment, it ended the long memory of millions of people who are in front of the TV screen as well. Crucial but reasonable, it ended for good. Maybe it will be equally crucial for us to see them grow old, being cheated and get divorced, which happened exactly in real life. The six guys should always be there, laughter but tears, smiles but fights, happiness but sorrow. Friends Blu-ray/DVD versions have been available for years on many stores, like Amazon, Walmart, BestBuy, etc. 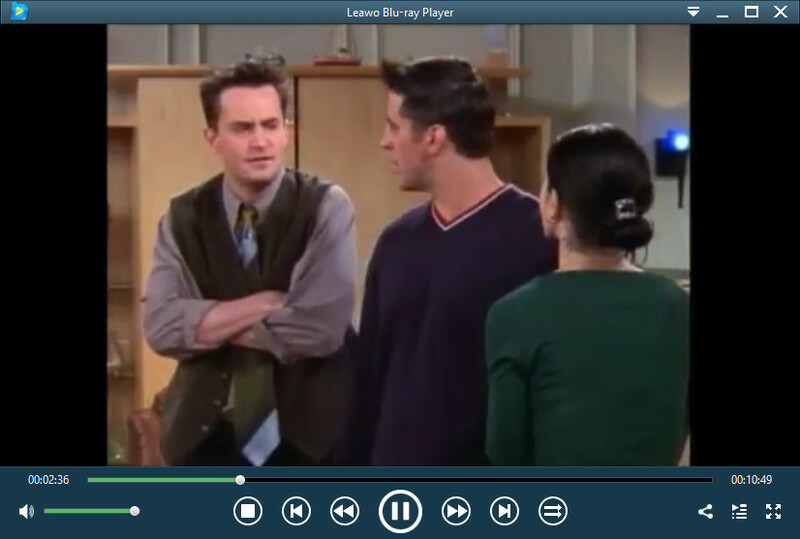 Since many people want to keep Friends Blu-ray as movie collection, therefore need to get copies of Friends Blu-ray disc for playback or sharing, this tutorial offers detailed solution on how to copy Friends Blu-ray disc and rip Friends Blu-ray disc for playback on computer and portable players like iPad, iPhone, etc. To copy Friends Blu-ray disc, you need to use Blu-ray copy software. Leawo Blu-ray Copy will be a good choice for you. As a top-rated professional Blu-ray backup program, Leawo Blu-ray Copy offers effective solutions to help you easily decrypt, copy and backup any Blu-ray/DVD disc to computer hard drive or blank disc with high quality. With this Blu-ray copy software, you could easily copy Blu-ray Friends to hard drive or another Blu-ray disc without any loss of quality. You could get a copy of Blu-ray Friends in only a few simple clicks. 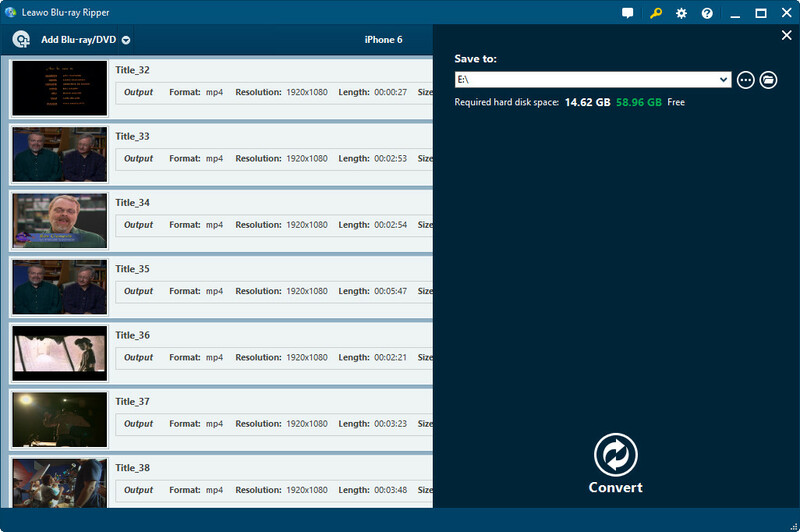 Decrypt, copy and backup Blu-ray/DVD movies to hard drive or blank Blu-ray/DVD easily. - Remove the disc protection and region code restrictions of Blu-ray/DVD discs. – Copy Blu-ray/DVD disc in 1:1 disc to disc, without any quality loss. – Copy and burn ISO image file to blank Blu-ray/DVD disc in one click. – Support movie-only Blu-ray/DVD backup. – Compress BD 50 to BD25, DVD-9 to DVD-5 and BD to DVD. Besides a Blu-ray copy tool, other things you need to prepare for copying Friends Blu-ray disc include: computer with at least one Blu-ray recorder drive (2 would be better), enough hard drive space, internet connection, and blank writable Blu-ray disc (if you want to copy Friends Blu-ray disc to a blank Blu-ray disc). With all things well prepared, you could check the below steps to learn how to copy Friends Blu-ray disc. 1. Insert your Friends Blu-ray disc into the Blu-ray recorder drive. Launch Leawo Blu-ray Copy. 2. Click the "Add Blu-ray/DVD" buttun to add Friends Blu-ray disc. 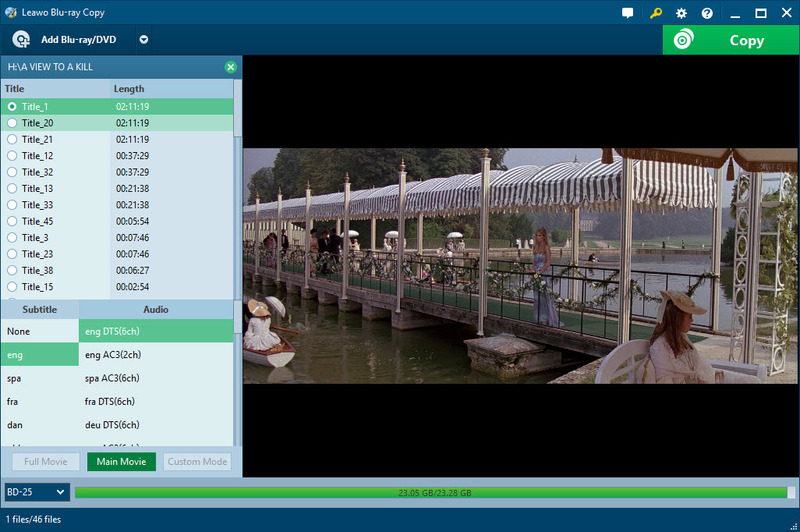 Set copy mode (Full Movie, Main Movie and Custom Mode) and output disc type at the bottom left corner. 3. Click the big green "Copy" button. On the popup sidebar, set the "Copy to", "Disc Label" and "Save to" options. 4. 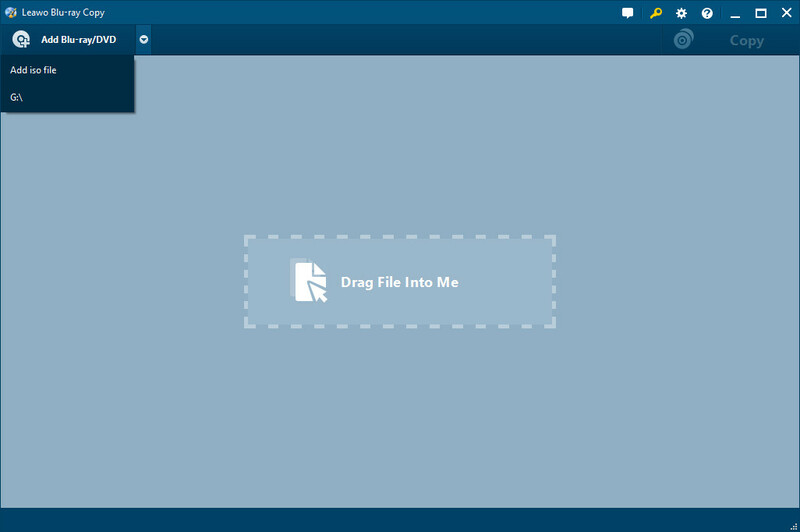 Click the bottom "Copy" button on the sidebar to start to copy Blu-ray movies with Leawo Blu-ray Copy. Full Movie copy mode would copy the entire Friend Blu-ray disc content onto another blank Blu-ray disc, while Main Movie copies only the main movie of source Friends Blu-ray disc. The output disc type you set should be in accordance with the target Blu-ray disc you plan to copy Friends Blu-ray disc to. If you plan to copy Friends Blu-ray disc to another blank Blu-ray disc, and you happen to have 2 Blu-ray recorder drives installed on your computer, insert the blank Blu-ray disc into the other drive and then select it as target under the "Copy to" option. "Copy to" option allows multiple choices. The above steps would be helpful to people who have 2 Blu-ray recorder drives installed on computer. However, most people would only get one Blu-ray recorder drive. Choose to create "ISO File" in Step 3 and then follow the below steps to learn how to copy the Friends Blu-ray ISO image file onto a blank Blu-ray disc. 1. Insert blank writable Blu-ray disc into the Blu-ray disc recorder drive. 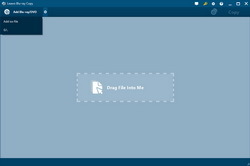 Drag and drop the created Friends Blu-ray ISO image file into Leawo Blu-ray Copy. 2. On the popup "Add iso file" interface, set "Copy to" and "Disc Label" options. Set the Blu-ray recorder drive as target under "Copy to" option. 3. Click the "Burn" button on the "Add iso file" interface to copy ISO image file to Blu-ray disc. 1. You could click the wheel icon on the top-right corner and then select "Copy&Burn" option to set the TV Standard, region code, and burning engine. 2. 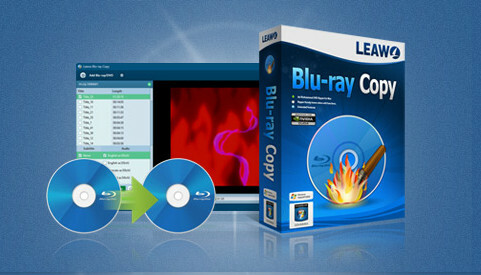 Leawo Blu-ray Copy gets both Win and Mac versions. So if you run on a Mac, you can turn to Leawo Blu-ray Copy for Mac. This guide is applicable to both versions. You could watch Friends for free online on many websites, like YouTube and Veoh. Also, Friends on Blu-ray/DVD discs could be played back on home Blu-ray/DVD players only when the player region code is the same as the DVD disc. There’s no difficulty for that. However, if you want to play back Friends on Blu-ray disc on computer or portable devices like iPad, things would be different. The below content shows you how to play Friends Blu-ray disc on computer and portable players. 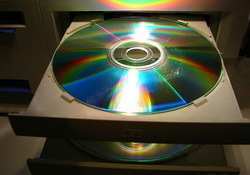 Friends DVD discs could be played back on any computer that comes with DVD drive, since most computers come with DVD player software. However, Friends Blu-ray discs might be not played back on computer that has Blu-ray drive. To play back Friends Blu-ray disc on computer, you need to install Blu-ray player software, which is currently not available on most computers. 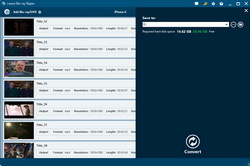 That’s what this part helps you – introducing you the best free Blu-ray player software, Leawo Free Blu-ray Player. With the assistance of Blu-ray drive, Leawo Blu-ray Player software acts like hardware Blu-ray player to play Blu-ray discs smoothly. What’s better is that it could even play back Blu-ray movie folders and ISO files to enhance your Blu-ray movie experience. It delivers true HD video quality of 1080P videos and lossless sound of Dolby, DTS, AAC, TrueHD, DTS-HD, and other advanced audio decoding files. Similar to other expert media player software, Leawo Blu-ray Player could still act as free HD video player, free DVD player, and free music player, supporting almost all video and audio formats. Sometimes you may want to watch Friends Blu-ray on some portable players to kill the long boring train journey, like iPad, Galaxy Tab, Google Nexus tablets, etc. Since most portable media players like tablets have no Blu-ray drive, you can’t directly play Friends Blu-ray disc with them. The only way is to convert Blu-ray Friends to video files that could be accepted by these portable players. Leawo Blu-ray Ripper could help you easily decrypt, rip and convert Friends Blu-ray disc to HD/SD videos in 180+ formats for almost all portable media players. 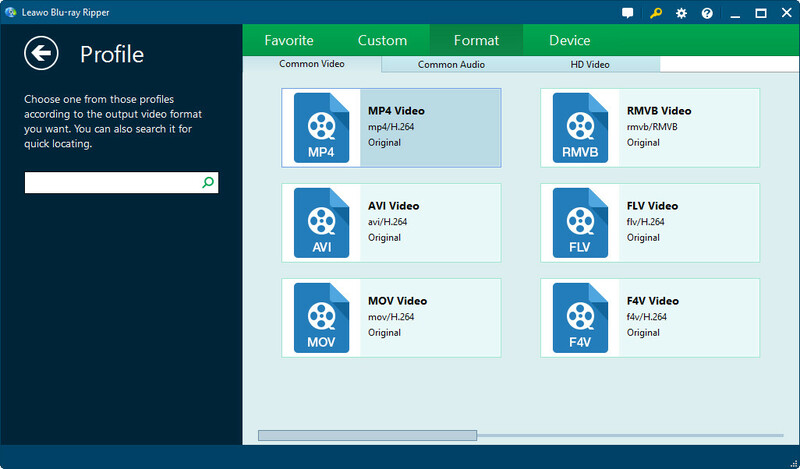 It could convert Blu-ray Friends to MP4, AVI, MKV, MPEG, MOV, M4V, FLV, WMV, etc. with high quality. 1. Click the "Add Blu-ray/DVD" button to browse and add Friends Blu-ray disc or Friends DVD disc. 2. Click the drop-dwon box right before the big green "Convert" button and then select "Change" option to set output format. 3. Click the big green "Convert" button to set an output directory in the "Save to" option. 4. Click the bottom "Convert" button on the popup sidebar to start converting Friends Blu-ray/DVD to video. You could load Friends Blu-ray/DVD disc in different modes: Full Movie, Main Movie and Custom Mode. Main Movie is recommended for storage saving. After loading Friends Blu-ray/DVD disc, you could select subtitles and audio tracks for output, play back Friends episodes, edit Friends videos by adding watermark or 3D effect, etc. If your Friends Blu-ray discs are encrypted, Leawo Blu-ray Ripper requires Internet connection for decrypting. In this way, you could also rip and convert Friends Blu-ray/DVD disc and other Blu-ray/DVD disc to videos for uploading to YouTube, blog, and other websites for sharing. After the conversion, connect your portable players with your computer via data cable and then transfer the covnerted Friends Blu-ray (now in video files) to your devices.